Child IK solver vel failed. Implementation of a general inverse position kinematics algorithm based on Newton-Raphson iterations to calculate the position transformation from Cartesian to joint space of a general KDL::Chain. Takes joint limits into account. Definition at line 40 of file chainiksolverpos_nr_jl.hpp. 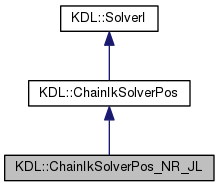 Constructor of the solver, it needs the chain, a forward position kinematics solver and an inverse velocity kinematics solver for that chain. Definition at line 30 of file chainiksolverpos_nr_jl.cpp. Definition at line 41 of file chainiksolverpos_nr_jl.cpp. Definition at line 111 of file chainiksolverpos_nr_jl.cpp. Calculates the joint values that correspond to the input pose given an initial guess. q_init Initial guess for the joint values. p_in The input pose of the chain tip. E_MAX_ITERATIONS_EXCEEDED if the maximum number of iterations was exceeded before a result was found E_NOT_UP_TO_DATE if the internal data is not up to date with the chain E_SIZE_MISMATCH if the size of the input/output data does not match the chain. Definition at line 62 of file chainiksolverpos_nr_jl.cpp. Function to set the joint limits. Definition at line 103 of file chainiksolverpos_nr_jl.cpp. Definition at line 115 of file chainiksolverpos_nr_jl.cpp. Definition at line 53 of file chainiksolverpos_nr_jl.cpp. Definition at line 112 of file chainiksolverpos_nr_jl.hpp. Definition at line 118 of file chainiksolverpos_nr_jl.hpp. Definition at line 123 of file chainiksolverpos_nr_jl.hpp. Definition at line 45 of file chainiksolverpos_nr_jl.hpp. Definition at line 44 of file chainiksolverpos_nr_jl.hpp. Definition at line 120 of file chainiksolverpos_nr_jl.hpp. Definition at line 122 of file chainiksolverpos_nr_jl.hpp. Definition at line 117 of file chainiksolverpos_nr_jl.hpp. Definition at line 116 of file chainiksolverpos_nr_jl.hpp. Definition at line 119 of file chainiksolverpos_nr_jl.hpp. Definition at line 113 of file chainiksolverpos_nr_jl.hpp. Definition at line 115 of file chainiksolverpos_nr_jl.hpp. Definition at line 114 of file chainiksolverpos_nr_jl.hpp.